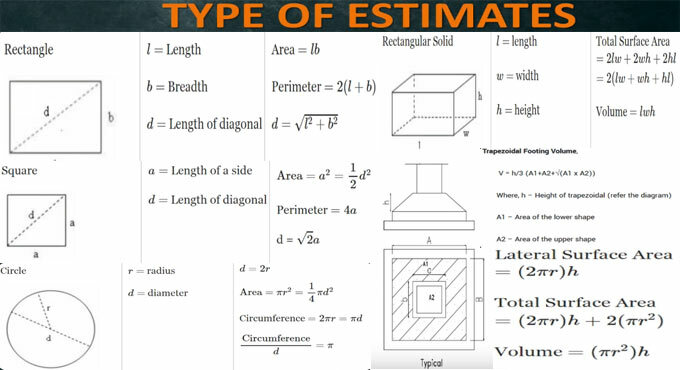 In this construction video tutorial, you will learn some of the important points which should be kept in mind beforehand while going to prepare estimation and costing. Besides, you will also learn how to determine area, volume, surface of elementary shapes. Approximate estimates – It is also known as preliminary estimate. It is prepared to create a forecast regarding the feasible cost of a future project in quickest possible time prior to commencement of the project. It is accomplished before choosing the final specification & design of the project. Details estimates – It is also known as prime cost estimating. It is prepared to make a through and detailed analysis concerning all the tasks necessary to deliver a project or product. Prior to start any project, it becomes essential to determine the prospective cost of construction. It is called as the estimated cost. Square meter – It involves shuttering, concrete pouring etc. Cubic meter – It involves concreting, excavation etc. To get detail information on geometric shapes and formulas, go through the following video tutorial.